The music format Operación Triunfo (2001–2011), which aired on RTVE for the first time in 2001, started as a television (TV) and musical success in Spain and today is one of the most famous shows around the world as well as an incredible socio-economic phenomenon in Spanish TV. This paper describes the format concept and results. Both commercial and social aspects are introduced to understand why, after 15 years, it is remembered with nostalgia and remains a shining example of a good communication project and a perfect balance between the global and the local, despite the lack of great success in the following years in Spain and abroad. One the biggest European television (TV) successes of the early 2000s was the music format Operación Triunfo (2001–2011), which was aired on Spain’s RTVE network for the first time in 2001, turning into one of the most viewed and prizewinning musical shows on Spanish TV. Developed by Catalan Gestmusic Endemol and the producers Toni Cruz and the Mainat brothers, the format’s structure partly evoked Starmaker (2001), a musical reality show born from Dutch John de Mol Produkties (then Endemol) and Popstars (1999-), a musical talent format aired in New Zealand in 1999, and in some ways, also Big Brother (1999-), an Endemol creation. The show aimed to find the country's representative for the Eurovision Song Contest 2002 in Tallin, and for 113 days it cloistered a selection of 16 young singers in an art school, called the Academia, where these singers were tutored by different professionals to become professionals themselves. Once a week, the contestants took part in a prime-time show, which was called Gala, to sing cover versions of famous pop songs. Through a week by week selection by the TV judges and the audiences at home, after 14 shows, the winner of the competition was named and five other finalists were chosen. Some of them are still very famous in the Spanish and Latin American music markets after 15 years. This incredible TV success is particularly interesting for TV format history because of the initial success in the country and the ambivalence of the format results abroad, based on the Latin attributes of the communication project (Spanish and South American music, presence of families and friends, paternalistic professors). First, the Spanish format has overtaken both Starmaker (2001–2008) and the lucky French adaptation, Star Academy (2012–2013) in terms of its economic results and success. A brilliant operation of TV marketing started from a programme designed for the Spanish market and immediately focused on other Latin markets: Portugal, the vast South American market, and also Italy, where a Spanish anchor hosted the programme (Miguel Bosé). The viewers’ reception of these musical reality shows in Italy, however, expressed a failure of the ‘Latin’ communication project, where a ‘banal transnationalism1 has been pushed for advertising reasons. Second, it comes from ‘old television,’ where the music is the protagonist but is, at the same time, a post-Big Brother reality show with a satellite channel that was completely dedicated to the Academia’s guests, and it is a peculiar and solitary Latin case study among the more studied talent formats, such as the Idols series. Finally, it was able to demonstrate incredible success in the music market, which has not been replicated in Spain or in other countries where the format was adapted, years before digital innovations changed the music market as we knew it then. The first Spanish edition of the programme (hereinafter, called ‘OT1’), apart from its commercial success (TV audience, advertising and merchandising), can be remembered as being a real phenomenon for the recording industry, having sold many platinum CDs. In this paper, the ‘uneasy relationship of music and television’2 is first briefly introduced, in order to find a place for music reality shows and musical talent shows among the different kinds of TV programmes in which music plays a role. Music in TV is thus introduced, as it is analysed in film studies as being extradiegetic, intradiegetic, and diegetic.3 Second, some of the most famous TV music formats are recalled in order to depict a few peculiarities of the present case study. Then, the production company and the Operación Triunfo format are described. Both commercial and social aspects are introduced in order to understand why, after 15 years, OT1 is still remembered with nostalgia, despite the format itself slowly losing its appeal to the audience. Additionally, after three seasons on the RTVE network, the format was acquired by the private broadcaster Telecinco (for five editions) until it was cancelled in 2011 due to low ratings. After 15 years from the first adaptation, after eight Spanish editions in over 50 countries in which the format was sold, after a decade of Idols (2001-), X Factors (2004-), and (The) Voice(s) (2010-), and after a new scenario for TV markets that has been opened up by technological innovation and new players, the programme Operación Triunfo still remains a shining example of the potential of the TV format as a communication project and as a perfect balance between the global and local. It is an important page in the history of music in and on TV. I don't make culture, I sell it. Television was born as an audiovisual medium, where the audio component that characterises it was shown in a flow of music, words, and background noise. The flow of sounds made the TV a ‘talking machine’ that invaded the surrounding environment and that did not require the user’s presence in front of the screen. However, audio is more of a way to hook the audience to the screen than the real protagonist of the experience of TV consumption, as is the case with radio consumption. Apart from sounds and words, this is also true for music.9 Still, at the same time and for different reasons, it is rare to find TV programmes that are really about music10 with some obvious exceptions, particularly in the multichannel world, where radio channels are also broadcast on TV. As TV is a medium for a generalist audience, or at least it was until the 1980s, before the proliferation of liberalisation and thematic channels due to the availability of digital terrestrial TV, cable, and satellite, it was not easy to find a place for niche genres. On one hand, apart from the classical music orientation of early TV because of the cultural origins of the first TV audiences and, on the other hand, because of the educational aims of public service broadcasters, pop and rock music later dominated TV programming. Pop music and rock n’ roll grew and adapted to each other indissolubly with TV. As genres, they undoubtedly owe something to the medium.11 Music, which was started as a way to attract audience attention in the first years of broadcasting, slowly took on different roles in relation to both programmes and commercials, since TV entertainment discovered ‘youth’ in the 1950s. Today, these different roles for music in and on TV programming can be distinguished, as in film analysis, between 1) the extradiegetic role, which serves as a flow between different programmes, such as in breaks or jingles in commercials or announcements, 2) the intradiegetic role, where music is the background music to a programme, for instance in theme songs or sound tracks, which have different functions, ranging from strictly technical use to aesthetic or functional use (such as the suspense element in formats like Who Wants to Be a Millionaire? ), and finally, 3) the diegetic when the music plays a role on screen. Figure 1. 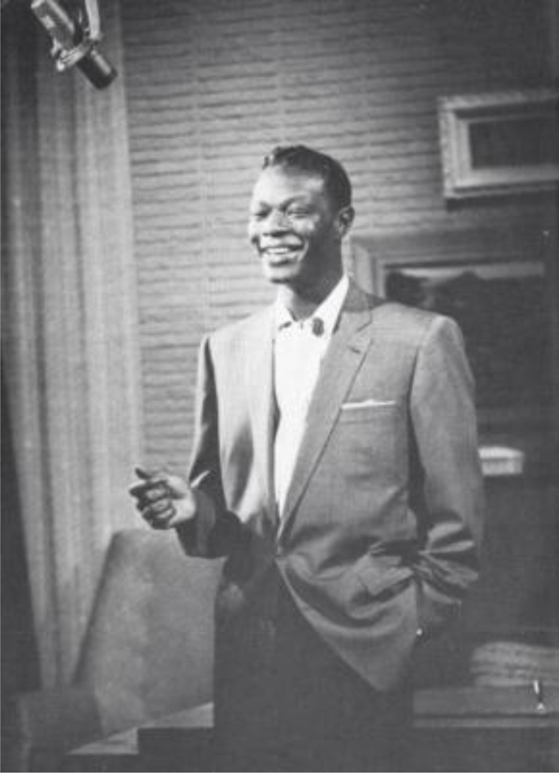 The Nat King Cole Show (1956–1957). Click here to see the source. Music is the star of a TV programme in the case of musical events, where TV has fostered the creation of the event itself or where the event existed first. Here, we find the Eurovision Song Contest (1956-), the Sanremo Music Festival (1951-) in Italy, or the Festival Internacional de la Canción de Benidorm (1959–2006) in Spain. Video 1. Le canzoni di Sanremo, Cinecittà Luce. Original source: La settimana Incom 01375 del 15/03/1956. Go to the online version of this article to watch the video. This is also the case with the broadcasting of live concerts, both pop and rock, from stadiums, and classical music in theatres and auditoriums or music performances that are hosted in a TV studio, which is also the case with old programmes, such as Six-Five Special (1957–1958) and Oh Boy! (1958–1959), or long running programmes, such as Top of the Pops (1964–200614) in the United Kingdom or Escala en hi-fi (1961–1967) in Spain. Figure 2. 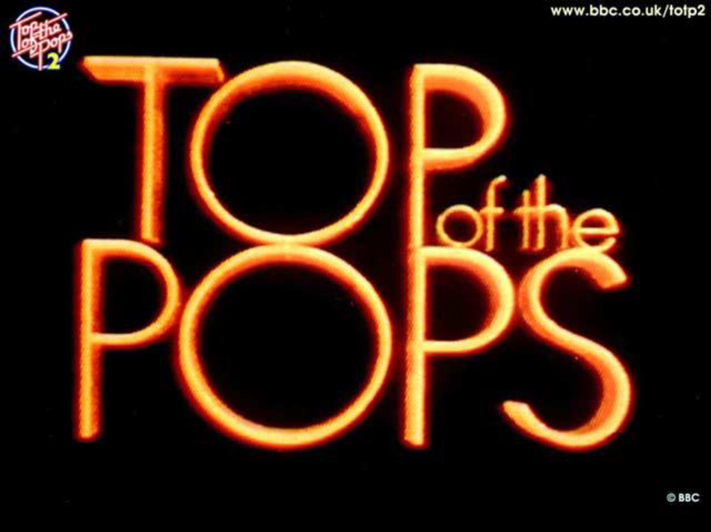 Top of the Pops Logo 1970s. Click here to see the source. Video 2. Coldplay perform “Adventure of a Lifetime” for Christmas Day Top of the Pops on BBC One (25 Dec 2015). See the original source here. Go to the online version of this article to watch the video. Finally, the music is particularly functional in talent shows as a ‘Warhol machine’ in order to gain 15 minutes of fame. The artistic and narcissistic aspirations to be part of the small screen have generated talent and musical reality shows, such as Popstars, Pop Idol (2001–2003), Fame (2003), El Número Uno (2012–2013), and, of course, Operación Triunfo, where music is the protagonist of the programme, but this is used more as a pretext to be on screen than for other reasons. The appropriation of TV by non-experts, and their convergence with the new marketing needs of the post-Big Brother reality shows (i.e. audience participation and ancillary exploitation that are used to maximise revenues) are the basic formula of some of the programmes that have enjoyed particular TV success in many countries in the last two decades. The ancestors of these programmes can be found in the ‘people shows’ of the analogue era of broadcasting, such as the family-oriented The Original Amateur Hour (1948–1970) and Tiny Talent Time (1957–1992) in Canada, Young Talent Time (1971–1988) in Australia, the Italian La Corrida (1986–2011), and Hacia la fama (1958–1959), Caras nuevas (1957), and Gente joven (1974–1987) in Spain. This was also the case with the Dutch Soundmix (1985–2002), the British Star for a Night (2000–2001), and Give Your Mate a Break (1999), which vary with respect to the prize, the voting procedures, and the ‘talent’ required from the performer. The basic formula is to offer TV studios to unknown people in order to make their shows on TV, according to the ‘dreams come true’ mantra. We have to look to New Zealand and wait until 1999 for Popstars or better to the Australian adaptation in 2000, to actually have the first successful example of the optimisation of synergies between TV, the music industry, stardom, and strategies for exploitation, which were all founded on the powerful shoulders of a media conglomerate, in this case Warner Music. Video 3. Popstars, First Episode Television, New Zealand, 1999. Original source: Ngā Taonga Sound & Vision - TVNZ Collection. Go to the online version of this article to watch the video. The original concept was produced by Jonathan Dowling who then licensed it to Screentime in Australia, for the search among thousands of aspiring singers for five girls who were suitable to form a pop group, which would be launched under the aegis of the TV show and Warner Music with their first album and concert series sponsored by the Austereo radio network and the production of the magazine New Ideas for the audience of the programme. In its first Australian edition, the 13 episodes broadcast during the fall of 2000, the programme reached a share of 53%, and the first group selected, the Bardot, topped the music charts in Australia and New Zealand with their first single, ‘Poison’ and, before breaking up in 2003, was involved in several successful seasons in terms of both concerts and sales. After the success came the exploitation abroad; almost every country in Europe and lots of countries on other continents created more or less successful adaptations of this appealing format, which staged big casting sessions in various cities. In 2016, the format is still being aired in Lebanon and Egypt. In the wake of Popstars, other programmes were created in which the matrix of music, reality, and interactivity was fully exploited. Audience participation from home was easier and more economical,18 and just one year after its pop predecessor, Pop Idol invoked audience interactivity and participation through its claim ‘But this time, you choose!’19 In one case, the contestants were watched 24 hours a day and trained in different disciplines; in the other, the programme was shown at different hours and on other channels and media. In others, the concept was converted into products such as CDs and magazines. Sometimes, the active participation of the public was required for the selection and elimination of the protagonists, and in some cases, even the most proper marketing decisions were shared, as in the Dutch version of Starmaker, in which the songs and the disk graphics were discussed on the programme’s website. Tracing a precise world map of musical reality shows and talents at the start of 2000 is quite difficult, as all the famous musical formats are different in many small ways, but, simultaneously, they are very similar, and lots of disputes have arisen as a result of copying and the scant legal protections under the copyright laws.20 Meanwhile, in Spain, a Latin socio-economic TV event was created at the end of 2001. Gestmusic Endemol is the format producer of the eight editions of Operación Triunfo. Today it is part of the Endemol Shine Group, more precisely part of its Endemol Shine Iberia division, the umbrella under which all the production companies situated in Spain and Portugal are grouped.22 In 1987 in Barcelona, it started as a local production company that was basically dedicated to humour programmes and slowly grew to conquer national channels as well as international markets. When the Spanish producers started working on the Dutch format Starmaker in order to create a product for the national market, no one was expecting such success.23 The format was created by Toni Cruz and brothers Josep Mª Mainat and Juan Ramon Mainat, and it was produced for the Spanish public service broadcaster, RTVE, to be broadcast on the TVE1 and TVE2 channels.24 There were 3,900 applicants for the first edition. The kickoff was on 22 October 2001 in prime time on Monday from 22:00 to 24:00 on TVE1, and was directed by Tinet Rubira with Carlos Lozano as host. A daily strip, called Resumen, was aired from Monday to Friday between 21:30 and 22:00 on TVE2. On Sunday, the Resumen del domingo was aired with Nina (a singer who was also the director of the Academia) as host. After selections in nine towns, 24 aspiring musical talents were hosted in the TV studio during Gala 0 and, of these, 16 were selected to enter as students into the Academia, a school that submitted them to eight hours of daily trials, including dance lessons, singing, acting, and vocal techniques. Figure 3. 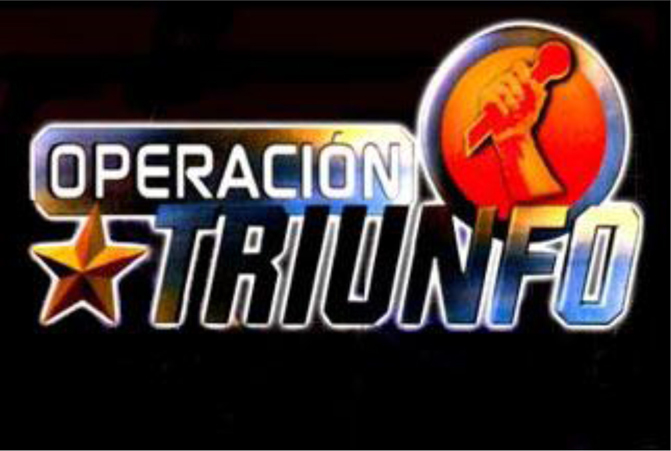 Operación Triunfo 1 – Logo. Source: RTVE. Each week, during the prime-time show, they had to sing a song chosen by the professors of the school, which they had been preparing during the various lessons. A jury of six experts in the Spanish music market drew up a ranking. The last four winners were at risk of expulsion. The candidate considered the best by the home audience through phone calls and short message services (SMS) was automatically saved. Teachers had the right to save one of the nominees due to their special merits, which had been shown during the week; other contestants could save another one. The two remaining contestants were submitted to the vote of the audience from home, and the eliminated candidate was announced live during the following prime-time slot. For the three finalists, the production was committed to promoting a career through the recording of a CD. The winner would have the honour of representing Spain in the Eurovision Song Contest that took place in Tallinn, Estonia, in 2002. Every week, a CD with the songs presented live was quickly recorded and sold a week later at a very low price and was distributed in supermarkets, train stations, and kiosks as well as through the typical music distribution channels. To complete the preparation, the contestants received visits from some important artists who were particularly interested in the promotion of their tour or album:25 Sting, Anastacia, Miguel Bosé, Laura Pausini, Shakira, and Lenny Kravitz among others. Even Paul McCartney received a visiting group of the students and professors of the Academia. Galas, Resumen diario, and Resumen del domingo occupied the weekly schedule of TVE1 and TVE2 from October 2001 to February 2002 for approximately five hours each. News and other programmes slowly started speaking about the programme and triunfitos daily. By the third Gala, the audience had already doubled. While the average share of network prime time for TVE1 in the same period was 27%, the average of Gala’s share was 43.37%.26 The final Gala was followed by 12.873 million viewers from a population of 35.244 million inhabitants, with a share of 68%! The daily version on TVE2 registered an average audience of 3.037 million viewers and an average share of 19.3%, compared to the very low average network audience, which was then 7.6%. Figure 4. 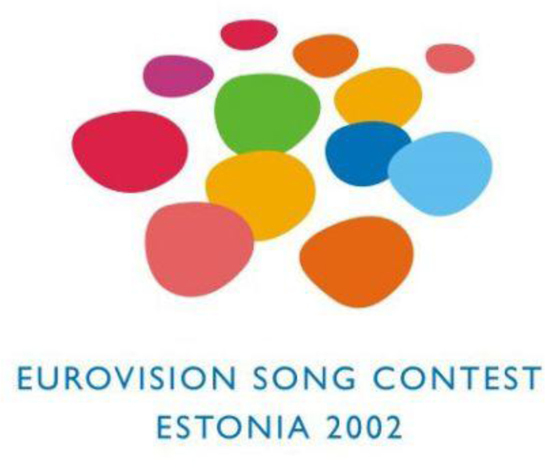 Eurovision Song Contest - 2002 Logo. Click here to see the source. Given its incredible success, after the final Gala, the programme was continued until March 11th in order to choose the Spanish representative for the Eurovision Song Contest from among the three finalists. At the end of programme, the triunfitos started a period of concerts and promotion, and RTVE took the chance to follow its creations. Triunfomanía was then launched, following the tour of the competitors, who gave 29 concerts in 23 towns, registering 60,000 people in the Santiago Bernabeu stadium in Madrid. The programme was aired on TVE1 and TVE2 on Monday, and it was seen by an average audience of 3.68 million viewers, with an average audience share of 29.53%. Gestmusic produced three other prime-time shows that were based on the personal success of the three finalists, and these were called, respectively, Bustamante y amigos,27 Bisbal y amigos,28 and Rosa y amigos.29 The latter programme officially ended the first edition of Operación Triunfo on 2 July 2002. Overall, in 2002, TVE1 and TVE2 recorded an audience average increase exceeding 4%. Moreover, OT1 also helped the networks appeal to a young audience, those between 16 and 24 and between 25 and 29 years of age who, from an average of 18.5%, increased respectively to 43.5% and 42.2%. Children also liked the programme, as an average share of 17.9% and 18.3% became 44.9% and 46.5%, for those between 4 and 9 and 10 and 12 years of age, respectively. While RTVE’s expenses for the acquisition of the programme and its production were high,30 economic revenues were exceptional. In addition to broadcasting over RTVE, from 27 December 2001, the programme kicked off something unusual for Spain: a thematic channel that was dedicated entirely to OT1, hosted on the platform Canal Satélite Digital, and which was named Canal Operación Triunfo. Rosa López represented Spain at the Eurovision Song Contest, which was held on 25 May 2002, in Estonia. She was accompanied on the journey by five triunfitos, who served as a choir. The song with which Rosa participated was ‘Europe's living a celebration’, a real smash during spring/summer 2002. Video 4. Rosa: ‘Europe’s living a celebration’ song. See the original source here. Go to the online version of this article to watch the video. Figure 5. OT1 – The competitors Source: RTVE. Spain did not win the competition, however. The Eurovision Song Contest was integrated into a programme that was more than four hours long, called Operación Eurovisión, with an average audience share of 40%. Three hours before the competition, Gestmusic produced a special programme live from Granada, Rosa’s birthplace, which was broadcast by TVE1. The Eurovisión Festival, for the executive production of RTVE, obtained an audience share of 80.4%, reaching 86.2% during the vote, with an average of nearly 13 million viewers (12,755,000). The Eurovision Song Contest is historically one of the most viewed TV programmes in Spain, as in the rest of most European countries, but Tallinn’s edition was unique. Until 2016, Spain took part in the competition 55 times; however, it won on only two occasions (1968, 1969). The method by which the Spanish performer is selected has been changing continuously over the years (mainly RTVE internal audits and music competitions have been used), but the association with Operación Triunfo was reinforced by the 2002 TV success. However, RTVE did not replicate those numbers, neither by selecting Operación Triunfo winners (in 2003 and 2004) nor in any other way. The carryover effect of OT1 was not reproduced, and despite the continuous attention from the press, the multimedia platforms, and the social network sites that emphasise the event, since 2004, the audience share exceeded 50% only in 2008. Figure 6. 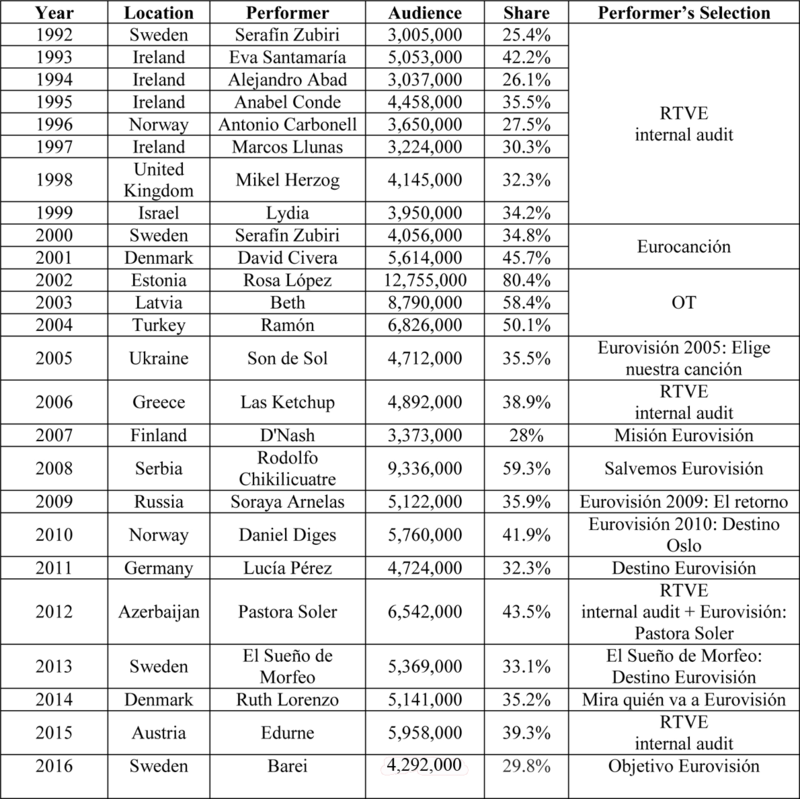 Eurovision Song Contest Spanish Editions (1992–2016): Audience, Performers and Selection Method. The data is extracted from different sources, such as: www.historia.foroeurosongcontest.es, www.vertele.com, www.eurovision-spain.com, www.eurovision.tv, www.rtve.es/television/eurovision, Wikipedia. Video 5. Eurovision Song Contest’s Greatest Hits 2015 - Rosa. Go to the online version of this article to watch the video. What has been done through advertising and promotion to launch OT1 and its artists was incredible for those years. Radio, Internet, satellite TV, and merchandising joined forces to create a socio-economic phenomenon that had no precedence in Spanish TV. Products marketed under the OT1 brand numbered about 200, with 22 different licensors. A magazine was created, called Operación Triunfo. However, musical success and Internet results were huge. 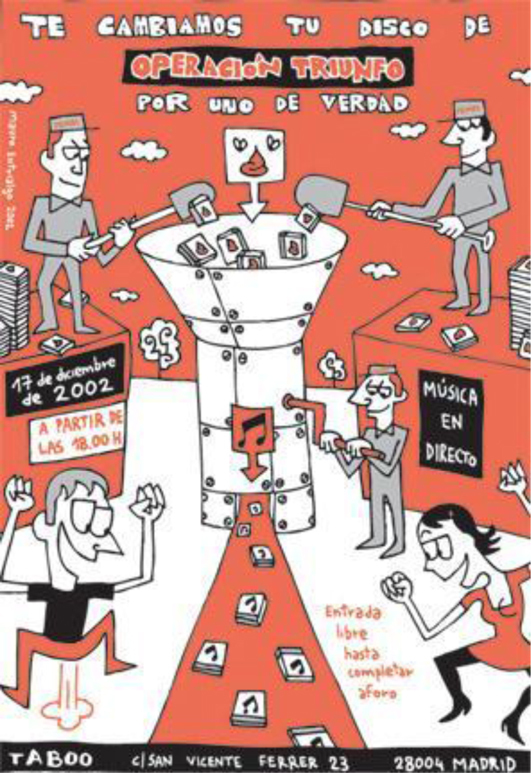 According to the Sociedad General de Autores Españoles (SGAE), in 2002, OT1 saved the Spanish music market. The programme created a parallel market in which the supply and demand for music produced, distributed, and promoted by the big TV machine was operated properly, while piracy was slowly eating into the then known physical market of CDs. This actually did not mean that the music market in general benefited from the programme, but something certainly happened. Radios were airing the songs from the programme repeatedly. Triunfitos were everywhere. Figure 7. ‘Otro Timo No’, 2002. Source: PEMOC. In the last decade, seven of the 16 triunfitos of OT1 have been professional singers,36 and some are still very famous.37In October 2016 a reunion of the OT1' singers has been planned by RTVE, featuring a concert and three documentaries about the first edition. Video 6. Viaje al centro de la tele – Después del triunfo (I), 2015. See the source here. Go to the online version of this article to watch the video. From the sale of albums and singles during OT1, RTVE, Gestmusic Endemol, and the small record company Vale Music received €36,000,000, until 2002.38 A film was also produced, OT. La Película, directed by Jaume Balagueró and Paco Plaza, which was released in theatres in Spain and was on sale as a home video, selling 500,000 copies, which were distributed by Manga Films. At the MIPTV 2003, which was held in Cannes on March 25th in the Palais de Festivals, a competition among the national winners of the Endemol format that proceeded from Starmaker was organised. For Spain, Chenoa, singing ‘It is raining men’, won against the eight competitors of Fame Academy (UK), Star Academy (France and Belgium), Starmaker (Netherlands), Factory of the Stars (Russia), Fame Story (Greece), Academia de Estrellas (Portugal), and Operazione Trionfo (Italy). As for the programme's official website, this was host to an independent portal, Portalmix SL, which began three years before. In addition, OT1 registered 130 million page views from October 2001 to March 2002. During the final stage, Portalmix received 4.5 million visits a month. During the broadcast, TV had an influence of 35% on the traffic of the portal, and when the programme was over, it continued to exercise an influence of about 17%, according to the then director. A ‘Club OT’ was created as an association into which viewers could enter by paying €25, this allowed members to browse internal sections and to have contact with the guys through meetings and concert tickets as well as discounts on merchandising. The membership card was also used to make purchases through the site. Among other major initiatives that were developed, there was the offer ‘Operación Internet,’ an ADSL connection offered by Terra España41 sold together with the membership card of Club OT. The offer, at €42 per month, was promoted through the TV show. The second edition, from October 2002, decreed a new season of success, albeit on a much smaller scale. Year after year, things were slowly changing in the format. Figure 8. Prime time rating. Source: Gestmusic Endemol website on Taylor-Nelson/Sofres A.M. data. Video 7. Last episode – OT11 ‘Los chicos se despiden’. See the original source here. Go to the online version of this article to watch the video. The music market started accepting the format, and the first incredible injection of records was not replicated, even if other triunfitos achieved some fame, sometimes in South America, due to the programme. Since 2006, and strongly in 2009, those characteristics that made OT1 a good ‘role model’ for reality shows disappeared. Moreover, other music formats were acquiring appeal in Spain, such as Factor X (2007–2008), El Número Uno (2012–2013), and La Voz (2012-), where one of the judges was David Bisbal from OT1, but there was also Tu cara me suena (2011-) as well as the children’s versions of the same programmes, and there was no more space for the very Latin and naïve flavour that had been expressed by OT1. However, none of the musical talent reached the OT1 results in any way. This best-effort show was easily considered to be ‘white’,43 full of positive values, such as partnership, humility, coexistence, self-denial, and the ethics needed for identity formation, and reconciliation with the excluded and those who were failures,44 against the conflict and personal tensions that were typical of other TV shows. A relationship between two competitors (Chenoa and Bisbal) was gently emphasised, almost hidden by the cameras. This music reality show, where the lives of the TV contestants who were enclosed in the school were constantly under observation without voyeurism, as was also the case in Amici di Maria De Filippi (initially called Saranno Famosi, 2001-) in Italy, differently from the more recent musical talents where educational aspects are less marked, expresses a TV style that is post-Big Brother, but, at the same time, that is part of a traditional world of entertainment, which is strongly linked to the needs that were expressed by the 1980s TV of ‘ordinary people’. The rise to fame was based upon hard work, talent, and being part of a community. However, the construction of the star was also a TV construction, which was helped by physical appearance, personal appeal, editing, direction, story-telling, and the transformation of the human being into a commodity to be sold on the market, but always under a moralistic umbrella,45 under the tutelage of the RTVE network (as in the case of the competitors’ relationships or in the case of the physical appearance of the winner, Rosa). The absence of official online videos, due to the lack of an agreement between RTVE and Gestmusic on the rights to distribute fragments of the OT1 edition, contributed to the creation of an aura of emotionalism, and it raised the triunfitos of the first edition to the Olympus of the Spanish Idols. Moreover, today, OT1 is a nostalgia programme and is remembered in this way. Video 8. Para todos la tele: ‘Operación Triunfo’. Go to the online version of this article to watch the video. The current success of musical reality shows and talent shows is clear, and this can be explained by considering a few factors. Music on TV is gaining new life in current schedules all over the world. Finally, no music format can be explained without continuous audience participation, on stage during the auditions and through prime-time shows, particularly the participation of voters and commentators, through the chance to participate offered by social networks and microblogging. It is a physical and virtual participation in the event and an opportunity to be part of a community of fans. The songs chosen, the judges as teachers or artists, and the contestants as performers (or as ‘good guys’55 or role models) can be judged and discussed on social network sites. This new kind of participation characterises the last 10 years of audience participation in TV shows and is both a source of revenue56 and a way to create viral stars that can be easily moved from TV to radio, YouTube, Facebook, Twitter, etc. Ten years before, things were slight different, as the OT1 case study can show. It was able to overwhelm the Spanish audience with ratings that were incredible for a music programme. It contributed to the transformation of the music market years before the digital revolution was firmly established, and the industry for live concerts was also changed. It opened new ways to interact with the public, giving nourishment to the Internet and the fan communities that were arising. It stabilised the calls from home as well as the SMS as a voting practice with high economic results. In these ways, it created enormous economic interests and gave life to music stars, who are still famous today. It received massive criticism from the music world but, at the same time, it was able to overcome this. All of this was Operación Triunfo in 2002, and, despite everything, history was made by TV in the music format. However, the star of the logo shined only for a few years, and the magic of the first Spanish edition has not been replicated in the following TVE editions, in the Telecinco adaptation, or abroad. When the ‘Latin’ attributes of the first Spanish version were highlighted, such as in the Italian version, a failure in the communication project has been identified, and the global aspects outlined by the editorial team did not obtain something that, years after, other music talents reached due to the US and British music star systems. Paola Savini (Milan, 1979) serves as an officer within the Italian National Media Regulation Authority, having previously worked as a consultant in the media sector. Her research interest focuses on media convergence, audiovisual production and pluralism. She holds a PhD from IULM University of Milan (2012), a BA degree in Media studies from La Sapienza University of Rome (2003), a master’s degree in European Studies and Global Affairs from the Catholic University of Milan and the Pázmány Péter Catholic University of Budapest (2005), and a master’s degree in Antitrust and Market Regulation from Tor Vergata University of Rome (2008).